I don’t know about you, but I always take a book with me on holiday. They are an excellent companion – providing entertainment, distraction, a very small pillow, and can help you start a fire. For my “holiday” in Central Otago, I was all set to take David Mitchell’s Ghostwritten. But the night before I left, I changed my mind and packed Cheryl Strayed’s Wild instead. 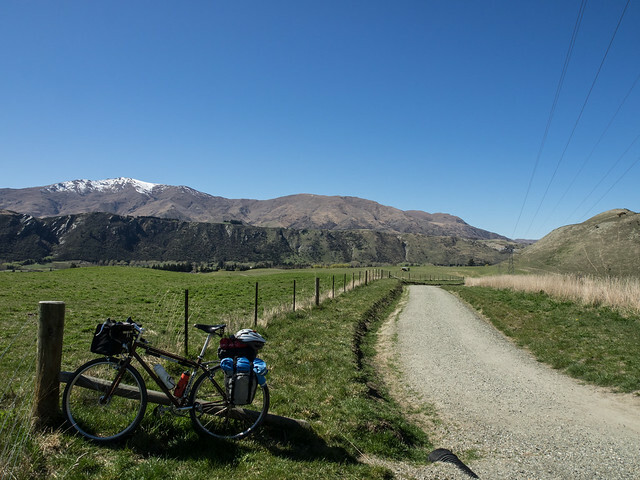 I thought it might suit the journey better – her thousand mile walk along the Pacific Coast Trail could perhaps echo my significantly shorter, but still slightly ambitious plan to cycle from Queenstown to Dunedin in four days. 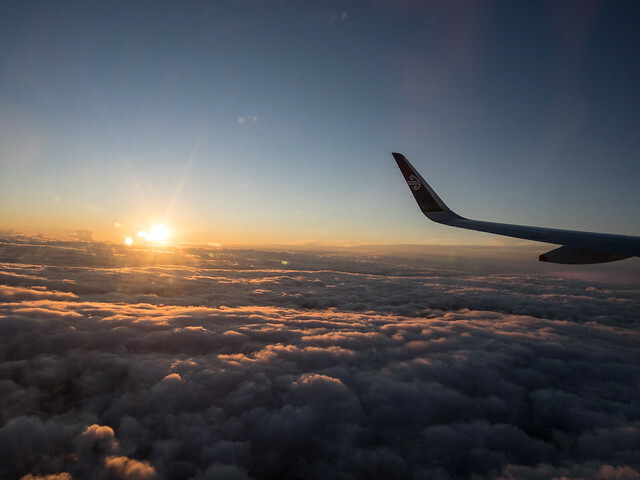 But when I started reading it, sitting in a plane, which was sitting on the Auckland airport runway waiting to take off, the book seemed like it might be a poor choice. It started with the traumatic account of Ms Strayed’s mother dying. As we lifted through the clouds to that beautiful other world above, our heroine started taking heroin recreationally. 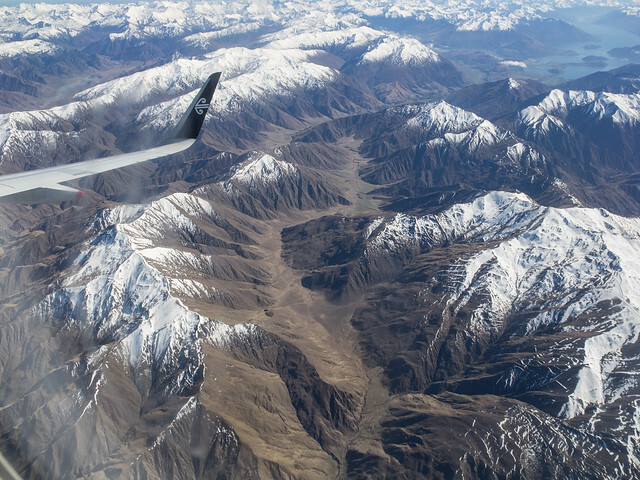 My flight from Auckland to Christchurch was uneventful, my flight from Christchurch to Queenstown was spectacular. The weather was clear and the scenery beautiful. Cheryl was still having a bad time though – she was plagued by disturbingly real dreams in which she was repeatedly killing her mother. So I put the book down, looked out the window and tried to work out where I would be riding. The weather was still lovely when we landed in Queenstown. I collected the Off-Roadrat from the oversize-bag area, where there was a sign directing me to a ‘Bike Assembly Point’ outside. So I followed the directions out there and found a proper(!) Park-Tools workshop stand, free for anyone to use. Brilliant. It was a particular treat for someone who does most of their repairs to bicycles that are leaning against the wall of the garage or lifted off the ground by some crappy assembly of F-clamps and rags. Local (or perhaps visiting) smokers had also been using the stand as an ash-tray. The ‘Rat was looking a little different from when it was last on an aeroplane – it was wearing a rear rack, with panniers. And I had replaced the somewhat worn Rock & Road tyres with a set of Clement MSO’s, that I thought might perform better on the significant amount of tarmac I would be riding on. 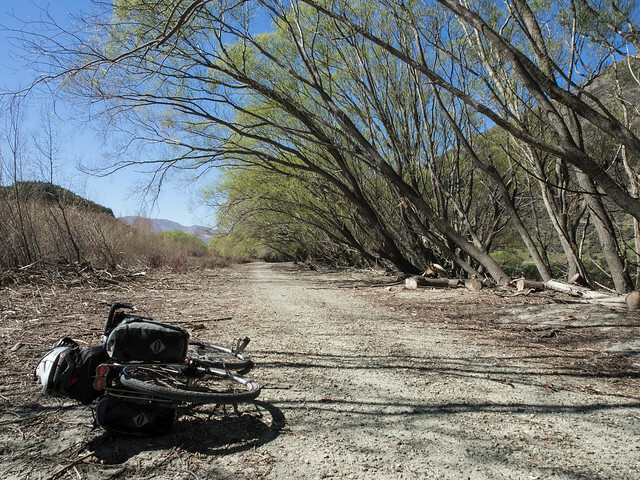 With the my bike reassembled, I rode off from the terminal searching for the nearest trail. 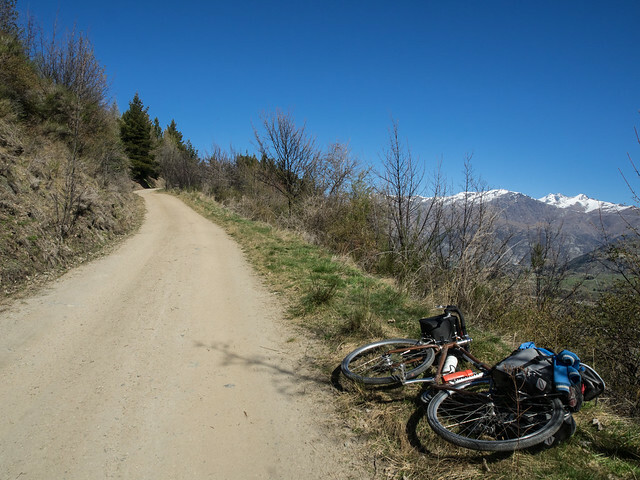 It took all of 5 minutes to find one that took me almost all the way to Arrowtown, almost completely offroad. Those trails around Queenstown are really excellent. 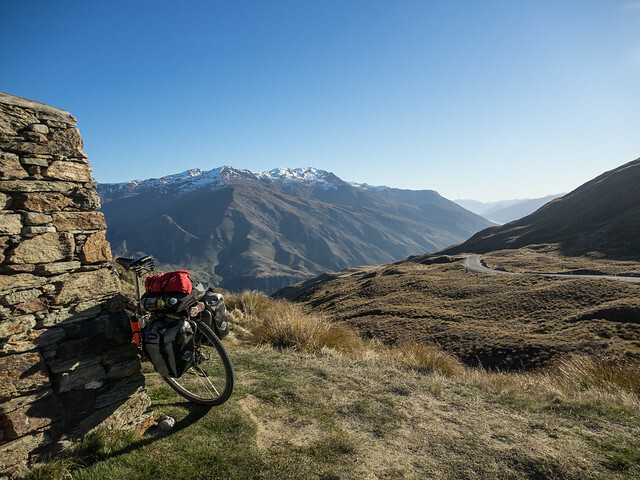 I would have been happy to spend a couple of days exploring them, but I had to get on – I was booked to stay in Wanaka that night, which meant I had the Crown Range to ride over. I got talking to another cyclist on one of the trails when I held a gate open for him. 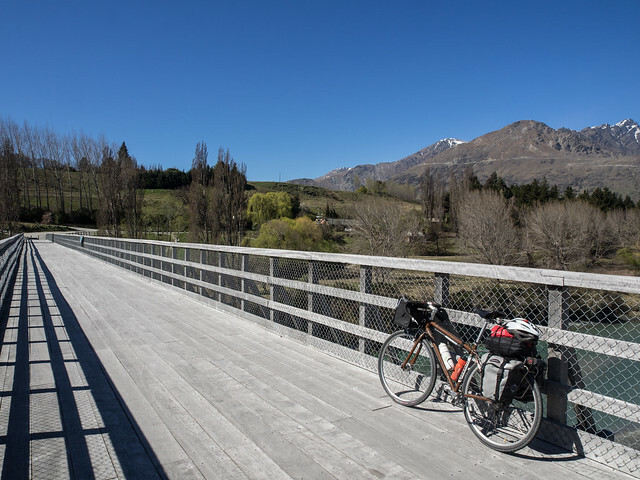 I told him where I was intending to ride – airport to Arrowtown, the Tobin Track that runs up the hill behind Arrowtown, over the Crown Range, and then on to Wanaka. He was skeptical that the Roadrat and I would be able to ride up the Tobin Track. But in my experience, guys on mountain bikes always think that non-mountain bikes can’t do anything except ride on roads. So I ignored his advice, but I did follow his suggestion to take a detour to visit the Edgar Bridge. Which was indeed worth going to see. 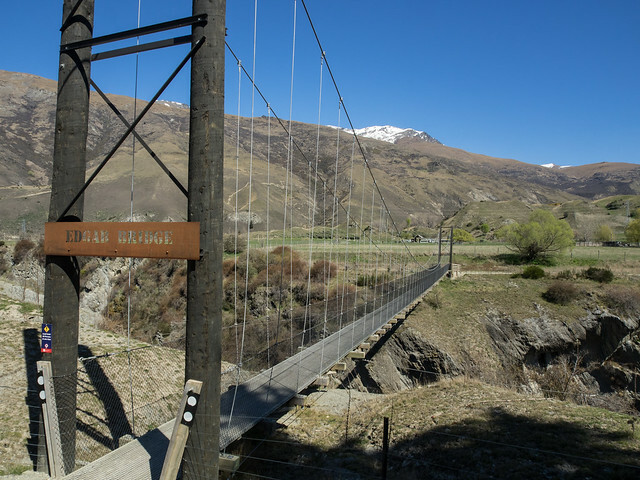 I arrived in Arrowtown mid-afternoon, bought some water, found the Tobin Track and rode up it. The Track was pretty steep (and a surprising number of people choose to drive their 4WDs up and down it on a Sunday afternoon). So I dropped all the way down to my granny gear and trundled up, stopping every now and then to get my breath back and not have a heart attack. At the top, I stopped for a proper rest and spoke to a local couple. They told me to be sure and turn right at the next intersection, which would lead me to the main highway. Turning left would apparently take me to Shania Twain’s house. A disturbing prospect indeed. I followed their directions and made it to The Crown Range road. 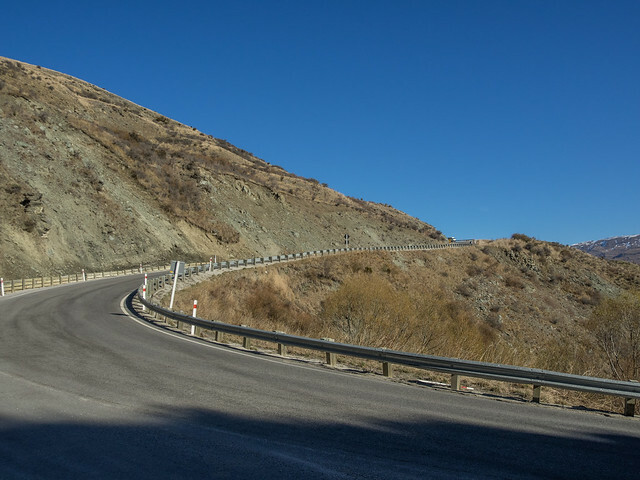 I read later that riding over the Crown Range is considered to be the third hardest hill climb in NZ. It’s probably good that I didn’t read that before I organised the trip. It. Was. Hard. One nice feature of the road, is that it’s equipped with “chain bays” – areas designed for people into pull over and put chains on their cars. If you are a cyclist you can use them to stand around pretending to take photographs while trying not to collapse. Or so I hear. At the top, I stopped to admire the view, but instead of sitting down, I had to stand in a weird half-crouching position to stop my legs cramping. I was able to stand up straight after a few minutes, just in time to chat to another guy on a mountain bike, who was going the other way. Coasting down the other side (for 30km!) wasn’t as much fun as I had anticipated – despite stopping to put extra layers of clothes on, I was freezing the whole way and couldn’t get comfortable on the handlebars. I arrived in Wanaka just as it was getting dark and spent quite a long time standing in a shower at the backpackers where I was staying, defrosting ,before having a very nice dinner at a local Indian restaurant and then crawling in to bed.